Needless to say, during our trip to Toronto and Montreal at the end of February, Adam and I ate A LOT. Amidst the great reunions and drinks with dear friends, we ate good food, we ate cheap food, we ate expensive food, and we ate some not so great food. This post is the first of many that discusses our gastronomic odyssey to the mainland. Some restaurants deserve their own posts, while some meals (like the Burger King we guiltily ate on St. Catherine Street) will be omitted. 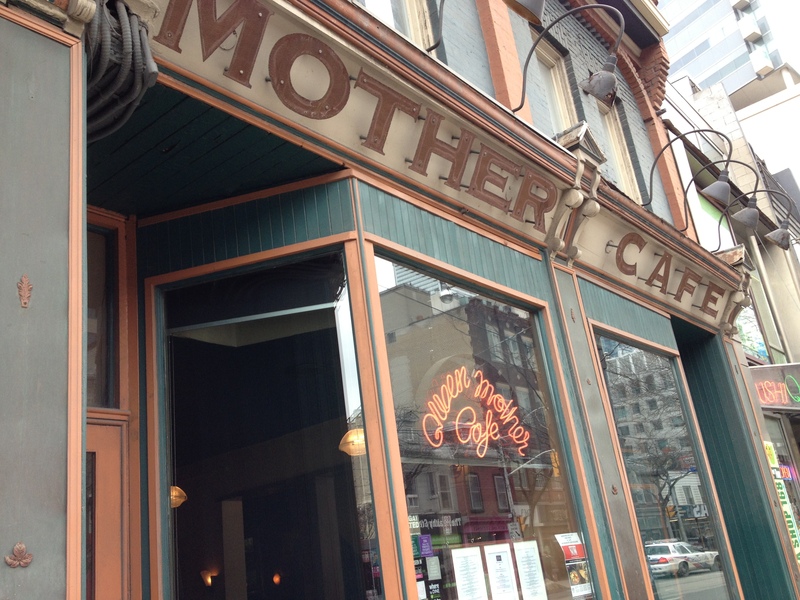 This post describes the good (Queen Mother Cafe), the bad (Cafe La Gaffe) and the donut (Little Nicky’s Coffee) as a means of introducing the awesomeness that was our trip. Starting our culinary re-exploration of Toronto, Adam and I met with my dear friend Krista for a weekday lunch date at the Queen Mother Cafe on Queen Street in the Entertainment District. I have to admit, while I was living in Toronto I walked by this restaurant a million times but for some reason I never ever ate there. The restaurant describes its cuisine as Lao-Thai pan-global, and I had stopped and read the menu dozens of time, intrigued by the varied offerings and the always full dining room. Krista is a frequent visitor to the restaurant and I was excited to finally be able to eat there. Adam ordered the special of the day, Pork Tenderloin Udon, and delighted in the spicyness of the dish. He thought that the meal tasted fresh and spicy, but overall, slightly forgettable. It was good, but just good. 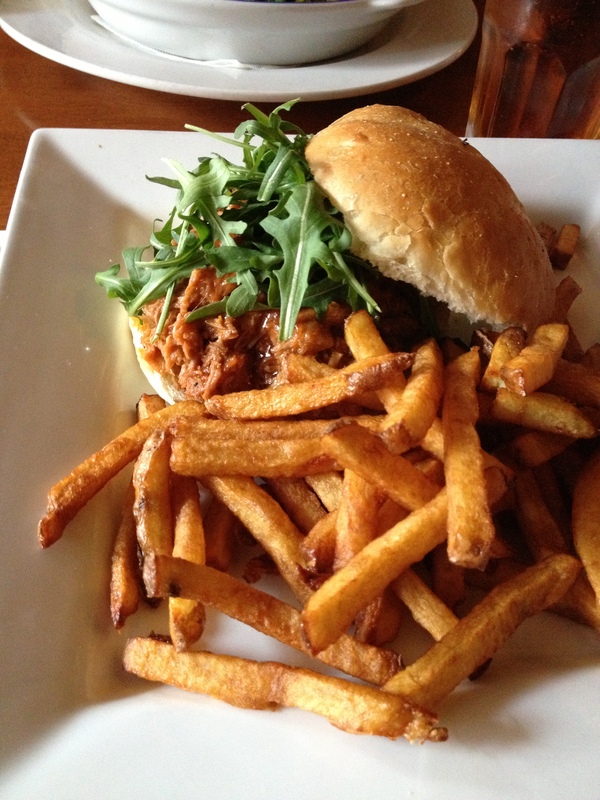 I was in the mood for something comforting and ordered the Barbecue Pulled Pork Sandwich. I really enjoyed the french fries, that were hot, fresh, and hand cut. I also appreciated the fresh argula that topped my sandwich, which is a variance on the classic coleslaw topper for pulled pork, of which I have never been a fan of. The addition of cheese to anything is always great in my books, and I liked the smoky cheddar that complimented the BBQ sauce of the pulled pork. 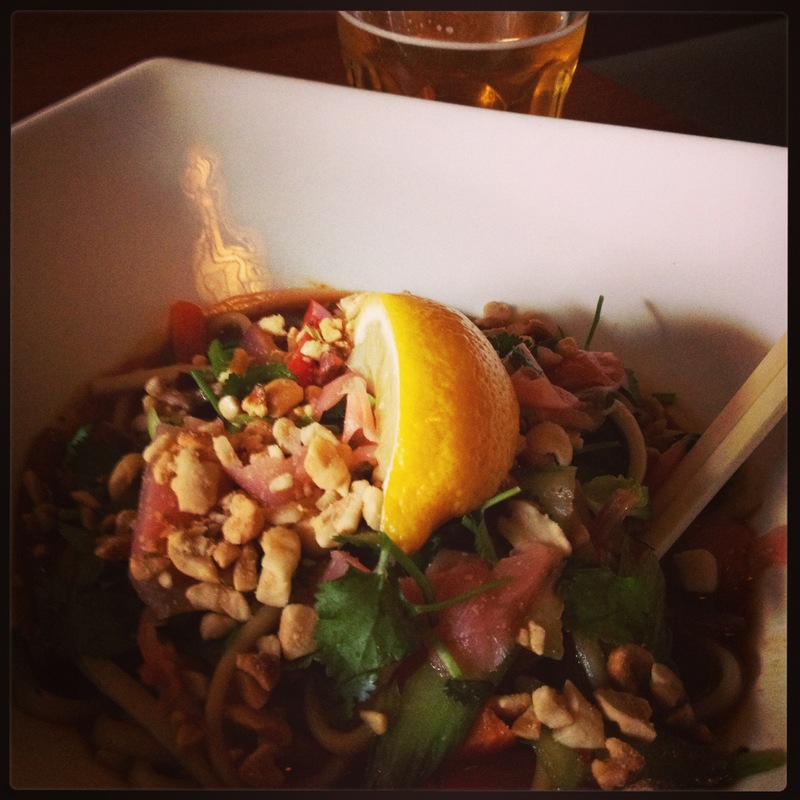 Krista was in the mood for noodles and ordered the laotian Khao Soy Gai. She really enjoyed her meal, which consisted of ginger, chicken, and a very comforting coconut milk sauce. The service at the Queen Mother Cafe was not the greatest. The restaurant was full the entire time we were there, and though we were seated right away, our server was not the most efficient. It was clear that she was rushed the entire meal. This restaurant has been a staple on Queen Street for 33 years, and I think will continue to be for a long time. Chef Noy Phongnanouvong provides fresh and interesting dishes for the busy lunchers of the downtown core and though I did enjoy my meal, it was good, but just good. Krista and I so happy to be reunited! It is with a heavy heart that I write about the next restaurant in our tuck triplet. 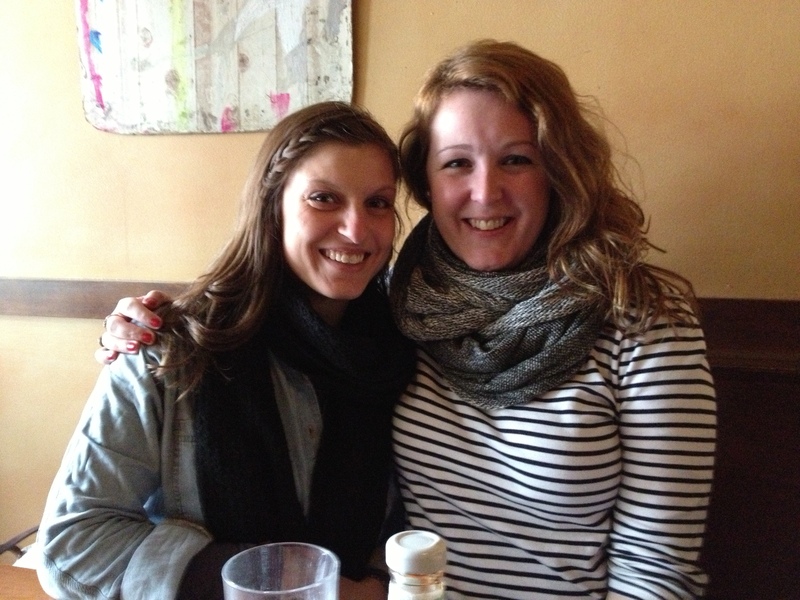 Cafe La Gaffe was introduced to me by the most awesome friend a girl could ask for in her grad program. Erin is funny, sweet, and we spent a lot of grad school at the library together, drinking afterwards, and of course eating. She showed me Cafe La Gaffe one afternoon and I was hooked. The eclectic artwork and colourful tablecloths drew me in immediately, and the food always had me coming back for more of the French/Mediterranean dishes. 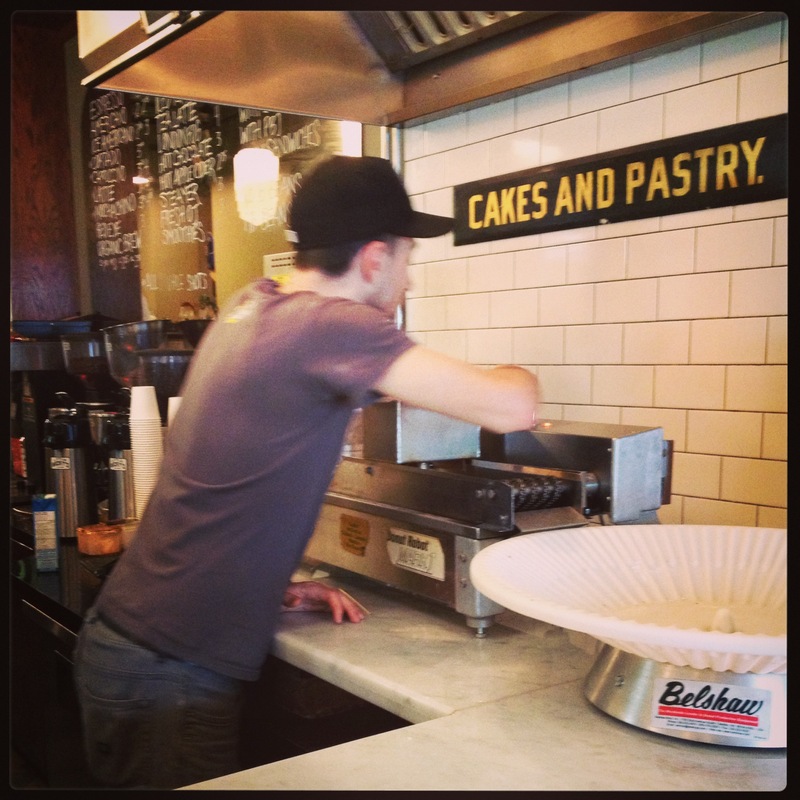 I loved this quaint little place on Baldwin Street near Chinatown, and I was so excited to take Adam there. But when Adam, Erin, and I showed up there on that rainy Wednesday afternoon we didn’t know what we were in for. First of all, the service. We were greeted at the door, not by the friendly staff that I remembered, but by a very unenthusiastic girl who cleared a table for us to sit down. 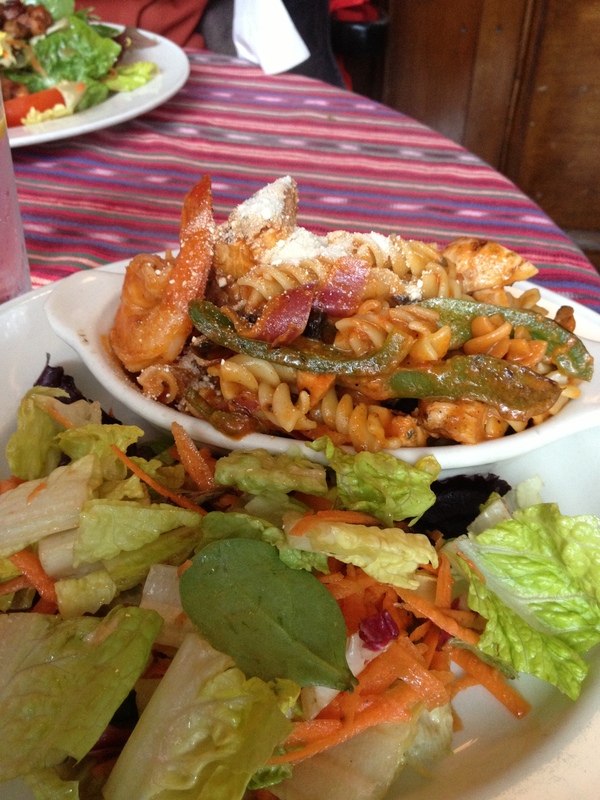 Adam ordered the pasta special that day, a chicken and shrimp dish with a spicy tomato sauce. Erin and I both ordered the Brie and Bacon salad, which we had both enjoyed before, and both loved so much we couldn’t not get the same thing, something I rarely do at restaurants! I will say that the food came out pretty fast, however, it did not look like what any of us were expecting. Adam’s pasta was served with a limp looking salad that consisted of sad shredded carrot and even sadder looking romaine, very different from the lush greens I was used to eating at Cafe La Gaffe. His pasta came with only one shrimp and was topped with powdered parmesan cheese…I have no words. Erin and I were equally disappointed with our salads. 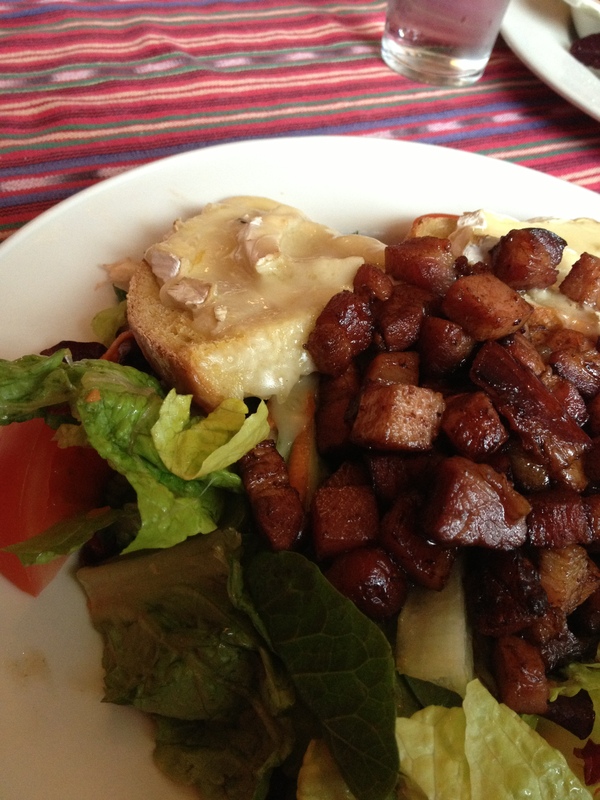 The last time I was at Cafe La Gaffe, I recall being very jealous of the cornbread that Erin had recerived with her Brie and Bacon salad and I was excited to have it this time around. When the food came out it just didn’t look right. The melted brie was smothering the cornbread, and there was just so much bacon. I am never one to complain about such a thing, but the bacon made the limp greens greasy and unappealing. I understand that restaurants have off days. Sometimes they don’t get the right produce order, or they are just so slammed that the preparation is sloppy, but on this day it felt like they had either changed their chef, or were majorly cheaping out on ingredients. The lunch date turned from a reminiscent enjoyment of great food, to a disappointed meal where I felt the need to make excuses to Adam about “the way the food used to be.” I nor Erin, who has been going to Cafe La Gaffe for much longer than me, had never had such a bad meal there. The ingredients were not fresh or flavourful. I really hope that this was a one off, but I cannot lie, the disappointment of the poor service and stale ingredients will not put Cafe La Gaffe on my must do list the next time I am in Toronto. Sacrebleu, what a shame. For the last bite of our trio of culinary morsels, I have to talk about one of the yummiest new things that I discovered in Toronto. It is not a brand new place (it’s been open since 2010), in fact, like the Queen Mother Cafe, I walked by Little Nicky’s giant mural sized signage many times while shopping on Queen Street, yet for reasons unknown, opted not to go there. Wow, I really did not know what I was missing. After my lunch date with Krista and Adam, he wandered off to find somewhere to study, while we met up with my grad school roomie Kara for some shopping. Post Queen Mother Cafe and all that pulled pork I was in desperate need of a caffeine pick-me-up and Krista suggested Little Nicky’s Coffee, which I accepted quickly, eager to finally enter the cool looking hole in the wall on Peter Street. As soon as we entered, the smell of baked goods entered my nose and my heart, and I needed to have whatever was making the sweet cinnamony smell. 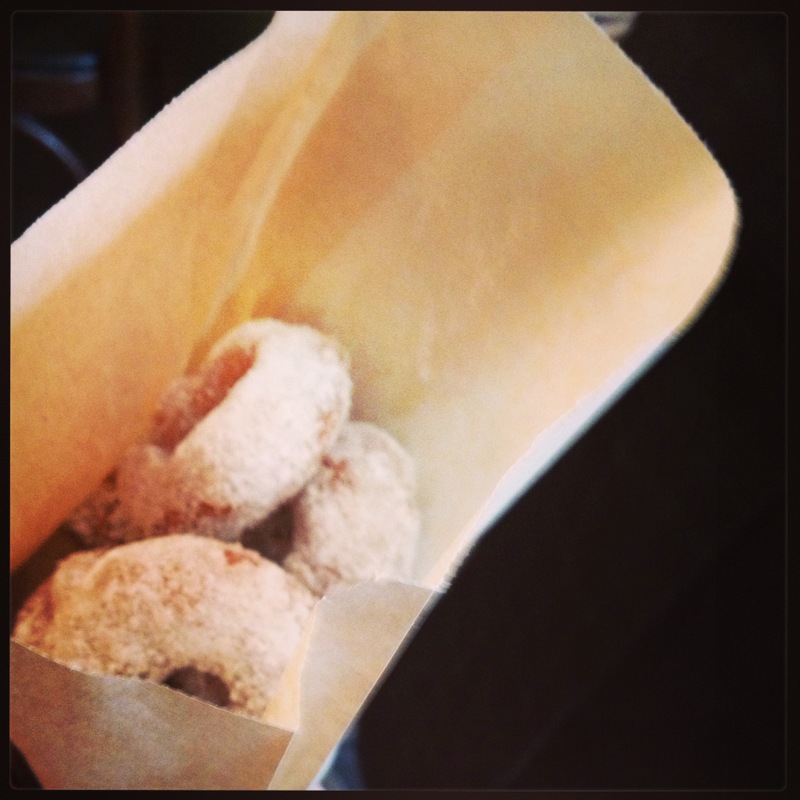 Krista informed me that Little Nicky’s not only makes awesome coffee, but their own mini donuts too! Obviously I had to order some, despite my near comatose fullness from lunch. What’s even cooler? They make them right there in front of you. It was amazing. 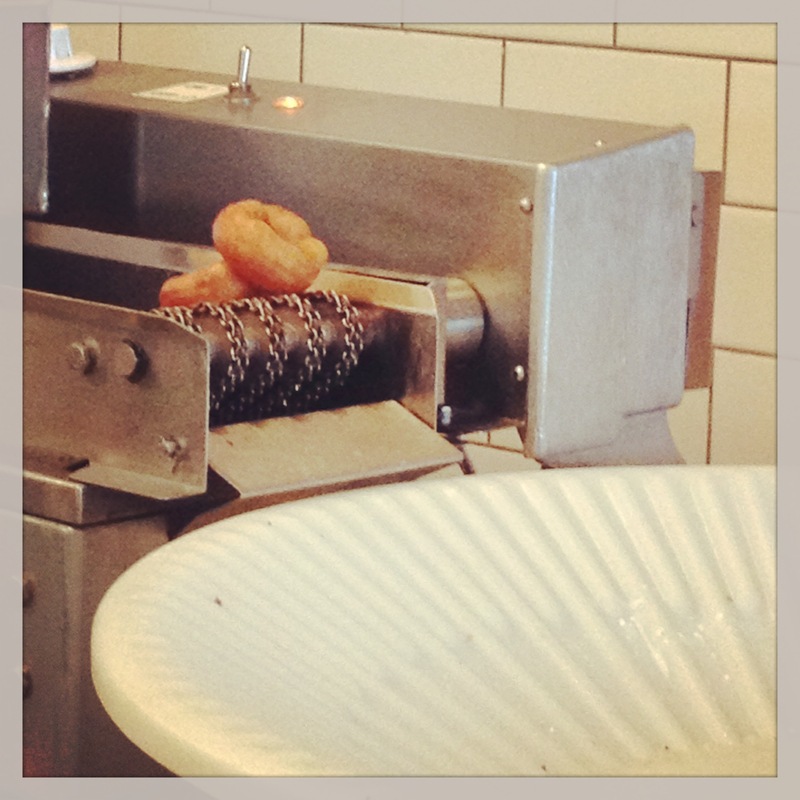 All the guy did was drop some delicious donut dough in a machine and out those sweet little snacks came off the conveyor belt, one by one, filling the room once again with that crave-inducing aroma. Once the half dozen donuts came off the conveyor belt the server then covered them with powdered sugar and cinnamon and handed them to me piping hot. They were de-li-cious. I have never eaten a donut hot and fresh like that, they were so good it will be hard to ever eat a cold Timmy’s Boston Cream again. Entertainment, amazing smells, and even better tasting treats all for a mere $2.75, and the coffee was great too! There are two lessons to be learned from the first set of establishments visited during my food marathon of 2013. The first being to always expect the best from your favourite places, but don’t be surprised if you get the worst. Give them another chance. The second is the next time that you are out and about in a neighbourhood you frequent, just take the chance and stop into somewhere that you haven’t been. Explore. Eat. Repeat in your own neighbourhood, you never know what you may be missing. Stay tuned for many more posts about the food that we ate on our trip! Enjoy.